Helminth infections and allergies are associated with TH2 responses. Whereas the development of TH2 responses and allergic disorders in pediatric populations has been examined in affluent countries, no or little data exist from low income regions of the world. The aim of this study is to examine factors influencing the development of TH2 responses of children born in areas endemic for helminth infections and to relate these factors to atopic sensitization at 4 years of age. Data were collected from pregnant mothers on helminth infections, education and socioeconomic status (SES). Total IgE, IL-5 in response to mitogen, and helminth antigens were measured in children at 2, 5, 12, 24 and 48 months of age. Skin prick testing (SPT) and allergen-specific IgE were determined at 4 years of age. Strong TH2 responses were seen at 5 months of age and increased with time. Although maternal filarial infection was associated with helminth-antigen specific TH2 responses, it was low maternal education or SES but not helminth infection, which was associated with the development of high total IgE and PHA-induced IL-5. At 4 years of age when allergen reactivity was assessed by SPT, the high general TH2 responses did not translate into higher prevalence of SPT. The risk factor for SPT reactivity was low maternal education which decreased the risk of SPT positivity to allergens (adjusted OR, 0.32; 95% CI, 0.12 – 0.87) independently of maternal filarial infection which tended to reduce the child’s risk for being SPT positive (adjusted OR, 0.35; 95% CI, 0.07 – 1.70). In areas endemic for helminths, potent TH2 responses were seen early in life, but did not translate into a higher SPT reactivity to allergens. Therefore, in many parts of the world TH2 responses in general and IgE in particular cannot be used for diagnosis of allergic diseases. Pregnancy and early childhood are critical periods in which the inherited immune system of a child is shaped by the environment both in utero and soon after birth. This in turn is thought to determine the disease outcome in older age. Previous studies have shown that the development of atopy can be linked to certain immunological patterns seen in cord blood or in peripheral blood during infancy. Several birth cohort studies such as in United Kingdom and Finland, revealed that higher cord total IgE levels were associated with atopic manifestations at 4, 10, or even at 20 years of age [1, 2], while in another large birth cohort study in UK atopic children at 5 years of age had higher total IgE at 12 months . In a small birth cohort study in Australia, children with atopy at 2 years of age already exhibited a decreased production of general adaptive T helper (Th)1 response at birth, followed by increasing allergen-specific-TH2 from 6 till 18 months of age, indicating that immune responses can be already skewed early in childhood . Another birth cohort study in United States showed that the levels of general adaptive TH2 cytokines at 3 months and 1 year of age was positively associated with total IgE at 1, 2, 3 and 5 years of age . All these studies demonstrated that any disturbance of immune responses which can translate into allergies in childhood seems to originate from very early life or in the first year of life. However, such important longitudinal studies have been conducted in affluent countries only. Given the alarming increase of allergic disorders in urban centers of low to middle income countries , it would be important to understand the relationship between TH2 responses and allergic disorders in these countries where helminth infections can be highly prevalent. Helminth parasites, like allergies, have been shown to be associated with TH2-skewed immune responses characterized by the increased production of TH2 cytokines (IL-4, IL-5, IL-13), polyclonal and specific IgE responses, and eosinophilia . Interestingly, a number of studies show that the presence of helminth infections is inversely associated with atopy as defined by skin sensitization , while association with allergic diseases or asthma have been less convincing and if anything, helminths seem to be associated with increased IgE responses to environmental allergens . However, in studies conducted in developing countries, the presence of IgE antibodies to allergens, has not always been a reliable predictor of skin prick test positivity or allergic diseases, especially in areas where helminth infections were prevalent . Thus, many children with high total IgE or positive allergen-specific IgE had negative skin test reactivity  or reported symptoms of allergy . In this context, socioeconomic factors can play an important role as has been shown by the multicenter ISAAC study in affluent and less-affluent countries where the positive association between atopic sensitization and atopic wheeze was weaker in countries with low gross national income per capita . Moreover it has been suggested that the result might apply to the association between IgE and skin test reactivity . These studies were mainly cross-sectional and conducted among schoolchildren or adults. Little is known about the development of TH2 responses at earlier time points in these less affluent countries, where helminth infections might be highly prevalent, and the relationship with allergic outcomes. To start addressing this, we have examined the development of TH2 responses and influencing factors in early life of children living in an area in Indonesia where helminth infections are prevalent. We hypothesize that early exposure to certain maternal environmental factors including helminth infection during pregnancy will affect the development of TH2 responses. Furthermore, we have related these factors to atopic sensitizations at 4 years of age. The participants for this cohort study consisted of pregnant mothers and their subsequently born children living in two adjacent villages, which were endemic for filarial (Wuchereria bancrofti) and soil-transmitted helminth (STH) infections, in Bekasi District, Indonesia, as described previously . Between 2002 and 2004, pregnant mothers who came to collaborating midwives for their prenatal care at the second or third trimester were enrolled. The children born full-term and healthy and whose mothers agreed to continue participation were followed up during house-to-house visits at 2 months (T0); 5 months (T5); 1 year (T12); 2 years (T24); and 4 years (T48) of age. A total of 84.3% (241/286) of children of enrolled mothers who continued to participate had immunological data available at least at 1 time point. The flow diagram of the study is shown in Figure 1. The study was approved by the Ethics Committee of Faculty of Medicine, University of Indonesia. The flow diagram of the cohort study. Drop outs imply that the participants have no data from this time point onward. Temporarily absent implies that the participants have no data at this time point but have data available at other time point. Maternal filarial infection was determined by detection of circulating antigens in blood using immuno-chromatographic test (ICT) as described by the manufacturer (Binax, Scarborough, ME, USA). Stool samples from mothers and children at 4 years of age were examined for the presence of STH eggs by lugol staining and microscopy, and positives were treated with single dose of albendazole 400 mg.
Data on socioeconomic status (SES) factors were collected via questionnaire during recruitment of pregnant women. Each factor was given a score: type of house wall (bamboo/wood/mixed with brick = 0, brick = 1), water supply (well = 0, pump/pipe = 1) and cooking fuel (wood = 0, kerosene = 1, gas = 2). SES is low if the sum of scores ≤ 2, and high if ≥ 3. Educational level is scored 0 if no or primary schooling and 1 for higher education. Ascaris lumbricoides adult worms were obtained from infected individuals in Indonesia and Brugia malayi adult worms were recovered from infected jirds. The method for antigen preparation has been described in a previous study . As previously described , whole blood was diluted 1:10 in RPMI 1640 medium (Invitrogen, Breda, The Netherlands) before stimulation with phytohaemagglutinin (PHA; 2 μg/mL; Wellcome Diagnostics, Dartford, UK), B. malayi adult crude antigen (BmA; 12.5 μg/mL), A. lumbricoides adult crude antigen (20 μg/mL) or medium only. After six day culture at 37°C and 5% CO2, supernatants were collected and frozen (−20°C) until cytokine measurement. IL-5 in supernatant was measured by ELISA as described elsewhere  and with a detection limit of 2 pg/mL. All values below detection limit were given half of the detection limit. Between two and seven subjects within each time point were excluded from the entire IL-5 analysis due to very low response to mitogen (< 10 pg/mL). Total IgE levels in plasma of mothers and children at all time points were measured using ELISA, adapted from the previous study . Children at 4 years of age were skin tested against house dust mite (HDM, Dermatophagoides pteronyssinus), peanut, egg, shrimp, histamine dihydrochloride 10 mg/mL as positive control, allergen diluent as negative control (kindly provided by Paul van Rijn, HAL Allergy Laboratories, Leiden, The Netherlands) and german cockroach (Blatella germanica; Lofarma, Milan, Italy). The tests were performed using SPT lancets (Stallergens SA, Antony, France) and were assessed at 15 min. The result was considered positive if mean diameter of wheal (the sum of longest diameter to the perpendicular diameter/2), was at least 3 mm. Specific IgE (sIgE) levels from pregnant women and children at 4 years of age were measured against two aeroallergens, HDM and german cockroach by ImmunoCAP® (Thermo Fisher Scientific, Uppsala, Sweden). The two allergens for sIgE measurement were chosen based on the most prevalent SPT positivity. Individuals were considered sensitized if the levels of sIgE were ≥ 0.35 kU/L. Total IgE levels were normalized with log-transformation and comparisons between baseline and other time points were analysed using Student t-tests. For child’s IL-5 responses which could not be normalized with log-transformation, Mann-U Whitney tests were used. Bonferroni’s correction was applied for multiple comparisons. Mean levels were expressed as geometric means with 95% confidence interval (CI), while median levels were presented with interquartile range (IQR). To be able to analyze all children in a longitudinal fashion including those with missing data at a given time point, a linear mixed model for log total IgE was performed to include individuals as the random effect. Maternal helminth infections, village of residence, SES, education, time variable and child’s baseline immunological data were treated as fixed effects. For the longitudinal analysis of binary outcomes of IL-5 (with median value as the cut-off), General Estimating Equation (GEE) analysis was performed to include time as the within subject variable and other factors as covariates. In addition to adjusting for the covariates in univariate models, all multivariate models were also adjusted for child’s gender. An interaction term with time was tested only for factors that have effects on an outcome variable over time. To explore the association between maternal factors and child’s atopic sensitization (SPT or allergen-specific IgE), univariate and multivariate logistic regression analyses were performed. P values were two-sided and were considered significant if < 0.05. All statistical analyses were done in SPSS 17.0 (SPSS Inc., Chicago, IL, USA). The baseline characteristics of mothers and children are shown in Table 1. Sixty four percent (153/240) of pregnant women had a low level of education and 43% (99/236) were classified as having low socioeconomic status (SES). Although low SES was more likely to be found in mothers with low education (49% in low-educated versus 29% in high-educated mothers), the overlap was only partial and therefore these two variables had to be considered separately. The percentage of pregnant women infected with filarial parasites was 19% (45/241) and with intestinal helminths was 31% (68/217). The loss to follow up at the end of the study was 41% (99/241). There were no significant differences in gender, maternal helminth infections, education and SES between those who remained in the study and the group that was lost to follow up, except for village of residence (Jati Karya village: 63% vs 43%, respectively, Chi-square test: p = 0.002). At four years of age, 10 out of 126 children (8%) were infected with soil transmitted helminths (STH) and since the prevalence was low, it was not considered in data analysis. The pattern of child’s total IgE production was markedly increased between T0 and other time points (P < 0.001; Figure 2A). Geometric mean (GM; 95% CI) of total IgE was 2.4 (1.9 – 3.0) IU/mL at 2 months, 24.0 (19.3 – 29.8) IU/mL at 5 months, 59.3 (47.7 – 73.8) IU/mL at 1 year, 196.8 (156.1 – 248.1) IU/mL at 2 years, and 345.9 (280.6 – 426.4) IU/mL at 4 years of age. The increasing levels of general TH2-type cytokine responses, represented by mitogen-stimulated IL-5 production, were seen in particular at T24 and T48 (Figure 2B). Longitudinal pattern of child’s general and specific TH 2 -type humoral and cellular immune responses. The levels of child’s total IgE (A), PHA-induced IL-5 (B), BmA-induced IL-5 (C), Ascaris-induced IL-5 (D) and unstimulated IL-5 (E) of children at the age of 2 months (T0), 5 months (T5), 12 months (T12), 24 months (T24) and 48 months (T48). The horizontal lines in the bars represent the median, with the lower 25% and upper 75% percentiles and extended whiskers the 10% and 90% percentiles. Comparisons were made between the baseline (T0) and other time points: *p < 0.05; **0.001 < p < 0.01, ***p < 0.001. In response to helminth antigens (BmA and Ascaris), IL-5 production increased significantly to reach a plateau at 4 years of age (Figure 2C and D). Spontaneous IL-5 production was low and did not increase significantly over the same time period (Figure 2E). In the univariate linear model, village of residence, low maternal education and low SES were associated with higher total IgE levels (Table 2). In the multivariate model, maternal education was the strongest factor inversely associated with child’s total IgE (adjusted estimate, 0.15; 95% CI, 0.05 – 0.25), followed by maternal SES (adjusted estimate, 0.12; 95% CI, 0.02 – 0.21) and village of residence (adjusted estimate, -0.21; 95% CI, -0.41 – (−0.01)). Figure 3 shows the difference in total IgE levels between children with low and high maternal educational level, where starting from 1 year of age, children with low-educated mothers had higher total IgE levels compared to those with high-educated mothers. 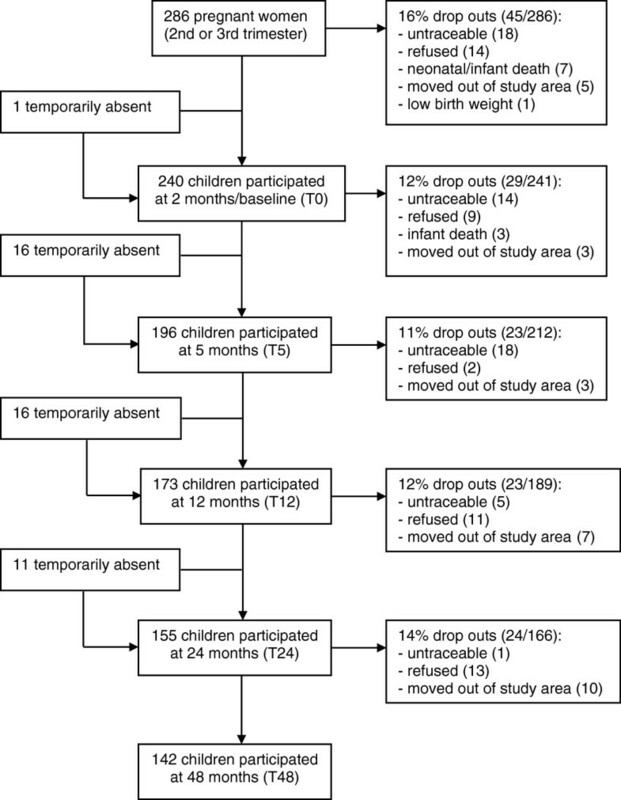 This change with time is indicated by the significant interaction between maternal education and time (Table 2). *Adjusted for other factors including child gender. ** P-int: P value on the interaction between time and the corresponding variable. P value in bold if significant (< 0.05). Adj: adjusted, OR: odds ratio, Ref: reference, NT: Not tested. STH: soil-transmitted helminth, PHA: phytohemagglutinin, BmA: Brugia malayi adult worm antigen, Asc: Ascaris adult worm antigen. Total IgE of children as a function of maternal educational status. Open triangle are children born to low-educated mothers, closed triangle are children born to high-educated mothers. Error bars represent geometric means and 95% confidence intervals of child’s total IgE, after adjustment for maternal helminth infection, village of residence, maternal education and socioeconomic status, child gender. The child’s general TH2-type cytokine production (PHA-induced IL-5) up to 4 years of age was only affected by maternal SES (adjusted odds ratio [adj OR] 1.47; 95% CI, 1.11 – 1.95; Table 2). Regarding helminth specific TH2-cytokine responses, there were positive associations between maternal filarial infection and IL-5 induced by BmA or Ascaris antigen, that remained significant after adjusting for village of residence, maternal education and SES (adj OR, 1.64; 95% CI, 1.14 – 2.36 and adj OR, 1.69; 95% CI, 1.11 – 2.58, respectively). Of 132 children having SPT, there were 2 children with positive SPT for negative control and 3 children with no histamine wheal; these children were excluded from further analysis. Of 127 children with available SPT results, 24 children (19%) were positive for any allergen tested. There were 21 children (16%) positive for cockroach and 9 children (7%) positive for house dust mite (HDM), with a total of 22 children (17%) positive for either or both aeroallergens. Among the skin test reactivity for food allergens, three children (2%) were sensitized to shrimp, one child (0.8%) to peanut and none were sensitized to egg. From those children with available specific IgE (sIgE) measurements, 58% (61/105) of children were positive for HDM with median of 0.93 (interquartile range [IQR], 0.10 – 3.21) kU/L and 55% (58/106) were positive for cockroach with median of 0.60 (IQR, 0.09 – 1.88) kU/L. In total, 64% (68/107) of the children had positive sIgE to either HDM and/or cockroach. To see whether SPT results correlated well with allergen-specific or total IgE measured at the same age, the IgE levels were compared between SPT-positive and SPT-negative children. No significant association was found between sIgE positivity and SPT. From a total of 93 children with available SPT and sIgE results, all 17 children with positive SPT, either to HDM or cockroach, had sIgE levels above 0.35 kU/L; while about half of children with negative SPT (41 out of 76) still had sIgE levels above 0.35 kU/L. We found no significant associations between total IgE and SPT reactivity, where SPT-positive children (n = 19; GM, 396.4; 95% CI, 208.4 – 753.9 IU/mL) had similar levels of total IgE compared to SPT-negative children (n = 95; GM, 330.3; 95% CI, 259.0 – 421.1 IU/mL). Next we asked whether maternal factors would affect the child atopy at 4 years of age, a time point when SPT and sIgE to allergens were measured. Low maternal education was significantly associated with lower risk of child SPT positivity and remained significant in the multivariate analysis (adj OR, 0.32; 95% CI, 0.12 – 0.87; Table 3). Negative trends were seen for an independent association between maternal filarial infection during pregnancy and child SPT (OR, 0.27; 95% CI, 0.06 – 1.25); however when adjusted for other factors, the confidence interval widened (Table 3). In terms of child sIgE, no significant association was found with maternal education or filarial infection. In contrast to maternal education, socioeconomic status was not significantly associated with any of the atopic markers. *Adjusted for other factors including child’s gender. §Allergen-specific IgE as the binary outcome using cut-off 0.35 kU/L. Adj: adjusted, OR: odds ratio. This follow-up study from birth to 4 years of age was conducted in an area endemic for helminth infections, and demonstrated development of strong TH2 type responses. Here, the total IgE levels already present at 5 months of age were three times higher than those in the United States  and at 4 years of age the levels were at least ten times higher than those in the Netherlands . These strong TH2 responses early in life, did not translate into proportionally higher prevalence of SPT to allergens at 4 years of age which at 19% was similar or even lower than the prevalence in affluent countries: 23% at the age of 3 yrs in Denmark  and 19.6% at the age of 4 yrs in UK . Surprisingly, the children from our study had two to four times higher prevalence of aeroallergen-sIgE compared to children of affluent countries at the same age [23, 24]. To understand this we have assessed factors that affected the development of general TH2 responses as well as atopic outcomes at 4 years of age. While maternal filarial infection was strongly associated with child’s helminth-specific TH2 responses, it did not appear to play an important role in the development of general TH2 responses. This indicates that maternal parasitic helminth status was not the strongest factor determining the TH2 polarization in these young Indonesian children. Indeed further analysis revealed that maternal education and or socioeconomic status had a significant influence on the development of total IgE responses. Children born to mothers with low SES or low education showed stronger development of total IgE responses over time than children born to mothers with high SES or high education. Interestingly at 4 years of age, children born to low-educated mothers had less chance of skin test positivity while maternal filarial infection had a tendency, independently of education level, to reduce the chance of a child being SPT positive. The increasing total IgE in children up to four years of age in our study was in line with a cross-sectional study in young Ethiopian children where it was shown that IgE levels were 16 to 20 times higher compared to the levels in healthy Swedish children . Recent cohort studies which were mostly conducted in children from affluent countries have studied total IgE and related it to allergic outcomes. It was shown that increasing levels of IgE were associated with atopic sensitization (defined as positive SPT)  or allergy symptoms . However, in our study the elevated total IgE did not seem to translate into high prevalence of SPT, the reason being that the total IgE measured in our study reflects largely IgE whose specificity remains elusive and is possibly clinically irrelevant. The levels of total IgE, however, can be very different between countries and races, which is partly explained by genetic factors ; although other factors can play a role too. Often helminths have been shown to influence total IgE [25, 28, 29]. In our study population, higher maternal education or socioeconomic status led to lower total IgE in a child. We consider these maternal factors as proxies for specific factors that influence child’s immune development. In previous epidemiological studies, higher maternal education and SES have been associated with better hygiene practices  which in turn could decrease exposure to microorganisms and parasites [31, 32]. Although the prevalence of child’s intestinal helminth infection at 4 years of age was low (8%), it is possible that past infection, exposure to helminth eggs without established infection or infection by other parasites induced TH2-type responses. In addition, other orofecal pathogens which were not measured in this study have been associated with decreased atopy in infected individuals [33, 34]. Besides hygiene, maternal education and SES can also be correlated with feeding practices (quality of nutrition and timing of first solid food introduction), maternal stress, antibiotics prescription, exposure to endotoxin and pollutants. All these factors can have long lasting impacts on a child’s atopic outcomes . Our study showed that maternal filarial infection clearly led to helminth antigen specific TH2 responses. Children can be sensitized to pathogen-derived antigens or allergens in utero [19, 36–39]. In our study, maternal filarial infection affected the development of child’s helminth-specific TH2 responses indicating in utero sensitization of child’s immune cells to filarial parasite antigens. Our results are in line with previous studies in areas endemic for filariasis showing that T cells and B cells of the newborns were capable of producing helminth-specific TH2 cytokines and specific IgE antibodies [40, 41]. 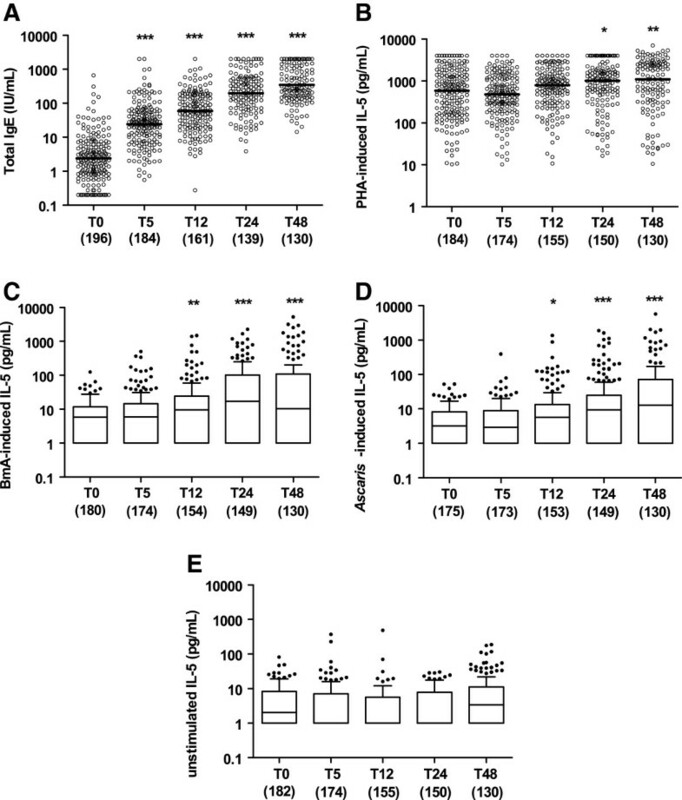 While on the one hand maternal filarial infection clearly affected child’s helminth-specific TH2 responses, on the other hand, it showed a tendency to decrease child’s skin reactivity and specific IgE production to allergens. Thus, early exposure to helminths might by stimulating helminth-antigen specific TH2-type responses, attenuate and deviate from mounting a TH2 response to allergens. Interestingly, exposure to filarial infection in earlier time points in these young children with a tendency for decreased skin reactivity does not appear different from what is seen in older subjects where increasing prevalence of filarial infection was paralleled with decreasing skin reactivity to aeroallergens . However, the difference seems to lie in the effect of helminth infection on allergen-specific IgE. In many studies so far, populations in areas where helminths are endemic bear high allergen-specific IgE [9, 43, 44]. Yet, in the current study we see that in early life, maternal filarial infection which is associated with helminth-antigen specific TH2 responses, is associated with lower allergen-specific IgE. Whether the allergen-specific IgE induced during early childhood represents more of a “real” sensitization to aeroallergens compared to those at older age reflecting more of cross-reactivity between helminth- and allergen-specific IgE  needs to be investigated further. The possible effect of helminth infections during pregnancy on child’s allergic disorders is supported by a randomized-controlled study in Uganda showing that praziquantel treatment of pregnant mother infected with Schistosoma mansoni increased the risk of eczema in their infants . Moreover the group also found that eczema was positively associated with allergen skin test result in infants, although they did not look into the direct association between the effect of maternal treatment and child’s SPT. The percentage of children who were lost to follow up at the end of the study was considered high (41%). Since the participants were similar to the non-participants with only difference in the village of residence, we considered the possibility of bias minimal, as we have included village as a factor in the multivariate models. For child atopic outcomes, since the number of tested children decreased at the end of study and that the skin test reactivity prevalence was low, these factors could weaken the power of analysis. However as the negative trend of association between maternal filarial infection and child’s skin test reactivity was also shown for allergen-specific IgE, this could indeed mean that exposure to maternal filarial infection affected child’s atopy. For more confirmation on this finding, a similar cohort study with larger sample size would be needed by taking into account the prevalence of maternal helminth infection and child’s skin test reactivity. With the limited number of potential confounders measured in our study and thus included in the analysis, it is possible that other uncontrolled confounders present during pregnancy and after birth could still affect the development of child’s Th2-type immune responses or atopy. Among these, family atopy, household crowding, duration of breastfeeding and pet ownership. In summary, this longitudinal study shows that young children born in areas endemic for helminth infections develop strong TH2 responses that increase with age at least up to 4 years of age, while the prevalence of SPT is not increased proportionally. Different maternal environmental factors determined by SES and education affect child’s TH2 responses. The challenge for the future is to delineate what precise factors mediate the effect of maternal SES and education on general TH2 responses as well as SPT to allergens. In addition, further studies are needed to address whether the protection against atopy will translate into less asthma and allergic disorders in later life. Written informed consent was obtained from the child’s guardian/parent/next in keen for publication of this report and any accompanying images. We thank all study participants and health staff of Puskesmas Jati Sampurna. We are grateful to Paul van Rijn from HAL Allergy Laboratories, The Netherlands, who provided allergens for skin prick testing. We also thank venipuncturists Sudirman and Heru, as well as Erlinda Marthias for cytokine measurement. This study was supported by The Netherlands Foundation for the Advancement of Tropical Research (W93-364 and W93-468), European Union Grant (MEST-CT-2005-020524-GALTRAIN) and Royal Netherlands Academy of Arts and Sciences (Ref.KNAW-05-PP-35). All authors have declared that they have no competing interests. MY conceived of the study and developed its design. YD carried out the field study, performed the statistical analyses and drafted the manuscript. TS participated in the study design and its coordination. HW participated in the study design and data collection. YCM participated in supervising the immunoassays and helped the interpretation of the results. SAV carried out the measurement of specific IgE. RvR supervised the measurement of specific IgE detection and helped to edit the manuscript. ES developed the immunoassays and helped to draft the manuscript. All authors read and approved the final manuscript.